ONE email each week. Easy to unsubscribe. No spam, ever. See below some of the responses from loyal readers of ES.next News. Given that trust, we strive to only provide relevant sponsors for our readers. The job sponsorship is a good investment if you are trying to hire developers who are specialized, qualified and passionate about what they do. The product ad sponsorship is highly suited for you if you’re writing a book or trying to get more engagement with your tool or service. You’ll be getting an email confirmation for your submission which you can change later on. 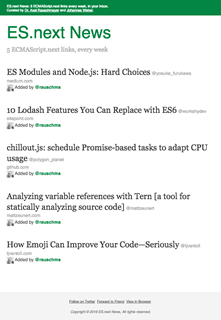 An ES.next topical article, talk, open-source library, or otherwise cool resource. A job offering – relevant to the tech sector – that you’re looking to draw attention to. A product, service, or a piece of content you’d like us to promote on ES.next News. Why advertise on ES.next News? 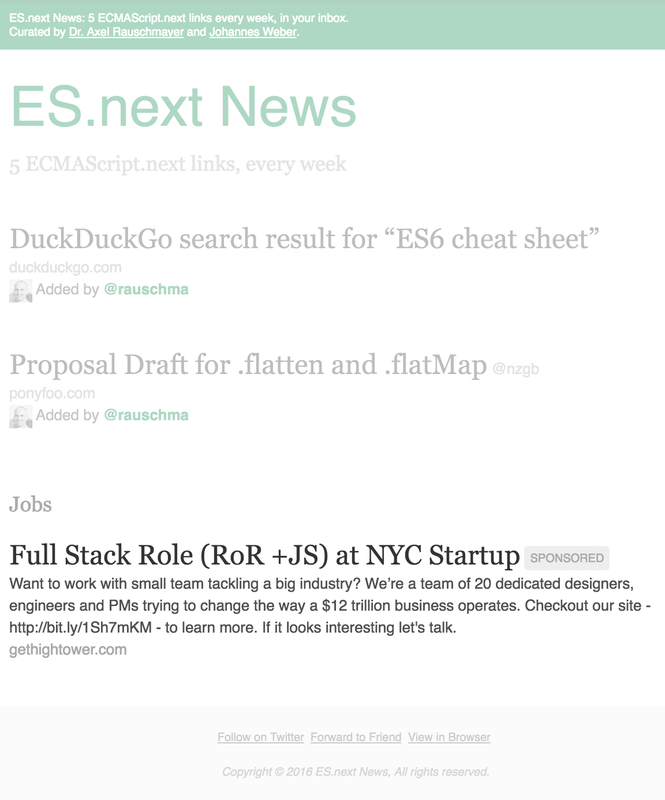 ES.next News reaches over 8,000 tremendously skilled and motivated developers. ES.next News has comparatively little content which has an enormous impact on the click rate (35 – 37%). If you want to reach software developers keeping an eye out for new tools, services and technologies, we can help. To see what ads looks like, consult our 23 Feb 2016 issue.